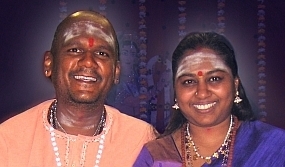 Swami Shanmuga & Amma Adi Sakthi are on tour around the USA. They have been invited to speak to the U.N.'s Society for Enlightenment and Transformation (SEAT). Phil McWilliams and Friends lead us into the Atlanta Programs with sacred songs that heal the spirit, invoke peace and encourage a deep connection with the Divine. Swamiji & Amma will be present. Experience the powerful love of the Divine Mother Sri Maha Pratyangira Devi and see Her within you. The Divine Mother's energy carried by Swami Shanmuga and Amma Adi Sakthi can be experienced in perceptible ways. This energy opens doors to higher consciousness, clears obstacles to abundance and soulful relationships and protects from negativity. Accompanied by satsang, talk, music and guided meditation, you are brought into a space where your soul is bathed by the Divine energies; here there is no difference between you and the Divine Mother. Simple techniques that can be practiced by anyone are given to allow you to continually access this energy. The program ends with each person getting a transmission of divine energy (shaktipat), which many have found to be permanently transforming. This will be a potent experience with the energies of the Divine Mother which brings great shifts in peoples' lives. Puja is an ancient technology. Through the sacred geometry of the yantra a door is opened into another realm through which the Source of our being, can come and physically be present with us. When we participate in puja ceremonies, we draw spiritual forces and energy around us. This spiritual energy has the ability to eliminate negative influences, and become a magnet for peace, prosperity and our true Divine nature. This puja will be performed to a rare and powerful aspect of Mother Lakshmi. It is a great blessing to be present for it. Hope you can have this opportunity!